Your customers are exposed to hundreds of ads a day between TV, Radio, browsing the web and their commutes to and from work. So what kind of ads do you need to create to really get their attention? We’ll work to answer that exact question in our latest series called “The Effectiveness of Signage,” where we cover the do’s and don’ts of sign advertising. Billboards. Everyone has seen them. From highways to downtowns, to the middle-of-nowhere ghost town that you’ve inadvertently stopped for gas at, there are billboards. Some might call them eyesores but, to businesses and advertisers they’re beacons for brand awareness. At least, that’s what they’re designed for; but do they actually work? 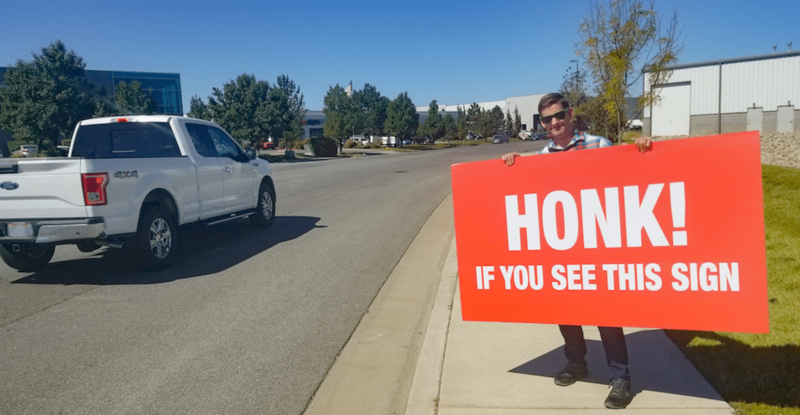 With 25% of overall revenue and over 800,000 daily impressions attributed to billboard advertising, Homie – an innovative real estate startup in Utah – is proving that outdoor advertising works. In this week’s installment of our Small Business Success series we chatted with April Wachtel of Swig + Swallow about her unique cocktail mixers and her experience of starting a small business through direct-to-customer distribution and customer and one-on-one customer relations. April purchased a vinyl banner to display at events and on-site tastings to help promote the Swig + Swallow brand. This week’s installment of our small business success series features Valerie and Dusty Scott, the owners of DustyBlues Photography Gallery in Logan, Ohio. They purchased vinyl banners and yard signs to direct visitors to their photo gallery. Today’s addition to our Small Business Success Series features Emily Lee from The Bow Next Door. Emily purchased custom foamboard signs to display product images and the company logo. This week, we chatted with Michael Messina from Rising Phoenix Pizzeria for another fun segment of our small business success series. Michael purchased see through window decals to display logos, business hours, and clever advertising. We are pleased to announce the first ever winner of the “Design Your Success” annual scholarship and the amount of $2000.00 to Joshua Fernandez of Rincon, Georgia. We are excited to share that Signs.com has been recognized by MountainWest Capital Network as one of the Emerging Elite companies in the state of Utah for 2017! We are honored to have been included in this exclusive group that shows our rapid growth we’ve experienced this past year. Signs.com Honored in Utah Business’ Fast 50! We’re excited to announce that Signs.com has been named to the 2017 Utah Business Fast 50 list for being one of the fastest growing companies in Utah! We’re pleased to have been ranked #38, which is a testament to the incredible growth that Signs.com experienced in the 2016 fiscal year. The submissions are in, the votes have been cast, and the winners have been decided. We are pleased to announce the winners of the Signs.com Home Is Where the Heart Is photo contest, and here they are!